01. Recommendation of Dividend 10% Stock Dividend i.e. 10 (Ten) bonus shares for every 100 shares. 02. Day, Date & Time of 19th AGM Tuesday, June 26, 2018 at 11:00 A.M.
03. Record Date of 19th AGM Monday, May 21, 2018. 04. Venue of 19th AGM Banquet Hall, Kurmitola Golf Club, Dhaka Cantonment, Dhaka. The valued shareholders, whose names would appear in the Depository Register as members of the Company on the “Record Date”, shall be eligible to attend & vote at the Annual General Meeting and be entitled for Dividend. The shareholders are requested to update their BO account with mailing address, contact number, bank details and 12 digits Taxpayer Identification Number (TIN) through Depository Participant before Record Date. This for information of all concerned that the Board of Directors of First Security Islami Bank Limited in its 183rd meeting held on Monday, May 08, 2017 at 3:00 p.m. has decided to purchase 56 Square Meter floor space at Ground Floor and 34.30 Square Meter floor space at Basement totaling 90.30 Square Meter at “Via Principe Amedeo, 273, 00185, Rome, Italy at a total cost of € 3,60,000 (Euro three lac sixty thousand) only (excluding Registration fees, Tax, VAT and other related charges) for the Exchange House of the Bank namely First Security Islami Exchange Italy S.R.L subject to approval of Bangladesh Bank. 01. Recommendation of Dividend 5% Cash Dividend and 5% Stock Dividend i.e. 5 (Five) bonus shares for every 100 shares. 02. Day, Date & Time of 18th AGM Sunday, July 23, 2017 at 11:00 A.M.
03. Record Date of 18th AGM Wednesday, May 24, 2017. 04. Venue of 18th AGM Banquet Hall, Kurmitola Golf Club, Dhaka Cantonment, Dhaka. 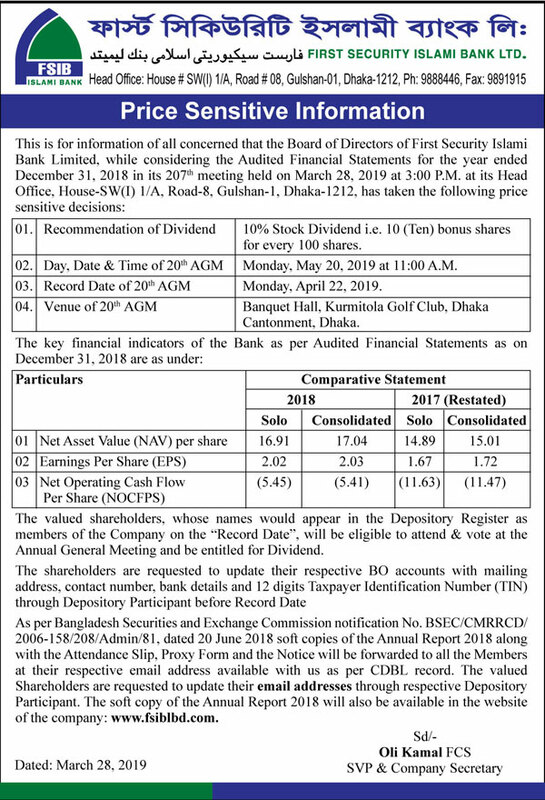 The shareholders are requested to update their BO account with mailing address, contact number, bank details and 12 digits Taxpayer Identification Number (TIN) through Depository Participant before Record Date. Those individual shareholders who will fail to update 12 digits TIN shall be subject to deduction of Advance Income Tax (AIT) @ 15% instead of @10% on cash dividend as per regulation. 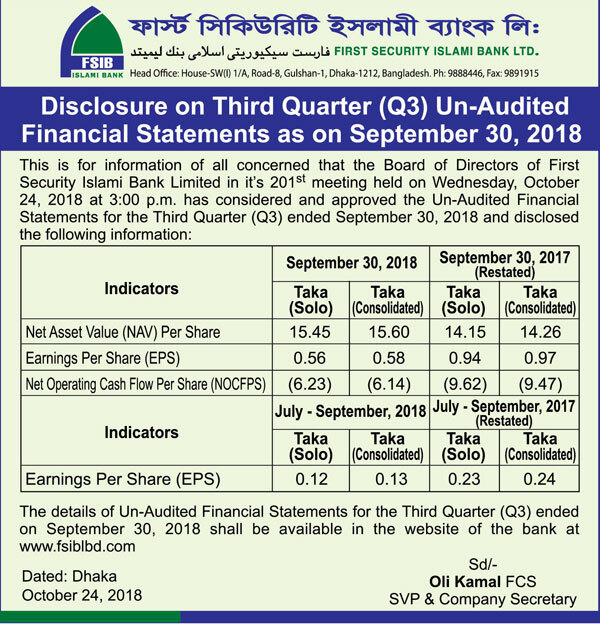 The details of un-audited financial statements for the Third Quarter ended on September 30, 2016 shall also be available in the website of the bank at www.fsiblbd.com. 02. Day, Date & Time of 17th AGM Wednesday, the April 27, 2016 at11:00a.m. 04. Venue of 17th AGM Banquet Hall, Kurmitola Golf Club,Dhaka. The valued shareholders excluding sponsors and directors, whose names would appear in the Register as Members of the Bank on the Record Date, shall be entitled to the Dividend if approved by the shareholders in the 17th AGM. This is for information of all concern that the Rights Shares of general shareholders against valid applications have been credited to the respective Beneficiary Owner (BO) Accounts through Central Depository System (CDS) of CDBL on January 18, 2015. The company expresses thanks to the honorable shareholders and all other concern, associated with this process for their timely support and cooperation. The valued shareholders, whose names would appear in the Depository Register as Members of the Bank on the Record Date, shall be entitled to the Dividend. The shareholders are requested to update their BO account with present mailing address through Depository Participant before Record Date. This is for information of the valued shareholders of the Bank that the Stock Dividend (Bonus Shares) @10% for the year ended December 31, 2014 as approved in the 16th Annual General Meeting held on May 09, 2015 have already been credited to the respective BO Accounts of the shareholders whose names appeared in the register of the Members of the Bank on Record Date i.e. April 02, 2015 through Central Depository System (CDS), except fraction shares. The payment of sale proceeds of fraction shares will be paid in due course. This is for information of all concerned that the Half-Yearly Financial Statements (Un-audited) of the Bank as on June 30, 2015 have already been dispatched to the shareholders of the Company to their registered address. The same financial statements have also been forwarded to the Bangladesh Securities and Exchange Commission and Stock Exchanges. 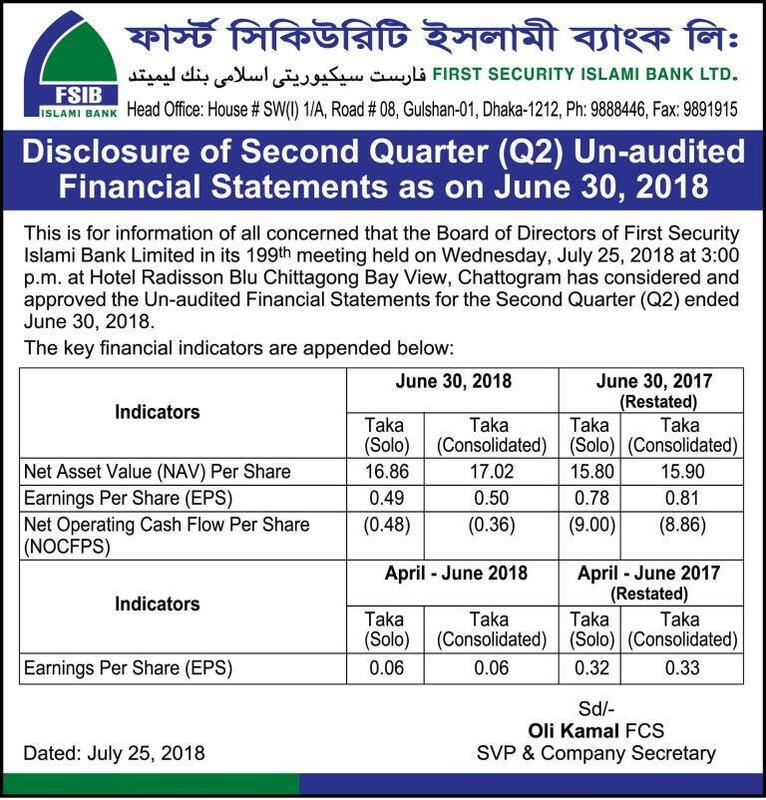 The Half-Yearly Financial Statements are also available in the website of the Bank at www.fsiblbd.com. 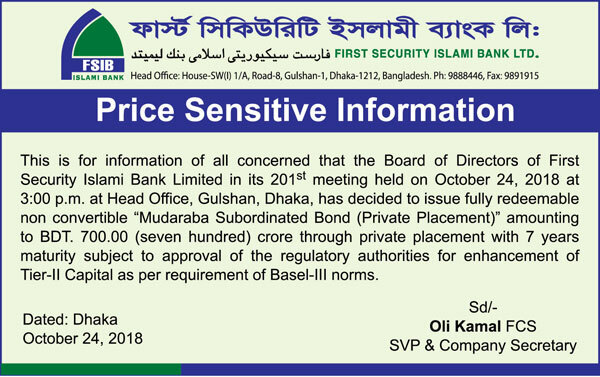 This is for information of all concerned that the Board of Directors of First Security Islami Bank Limited in its 162nd meeting held on August 09, 2015 at 4:30 p.m. has decided to purchase a commercial floor space measuring 5,000 square feet and 3 Car Parking along with proportionate land at Khulna Trade Square (1st & 2nd Floor), House # 19/1, Kakrail Road, Shantinagar, Dhaka at a total cost of Tk. 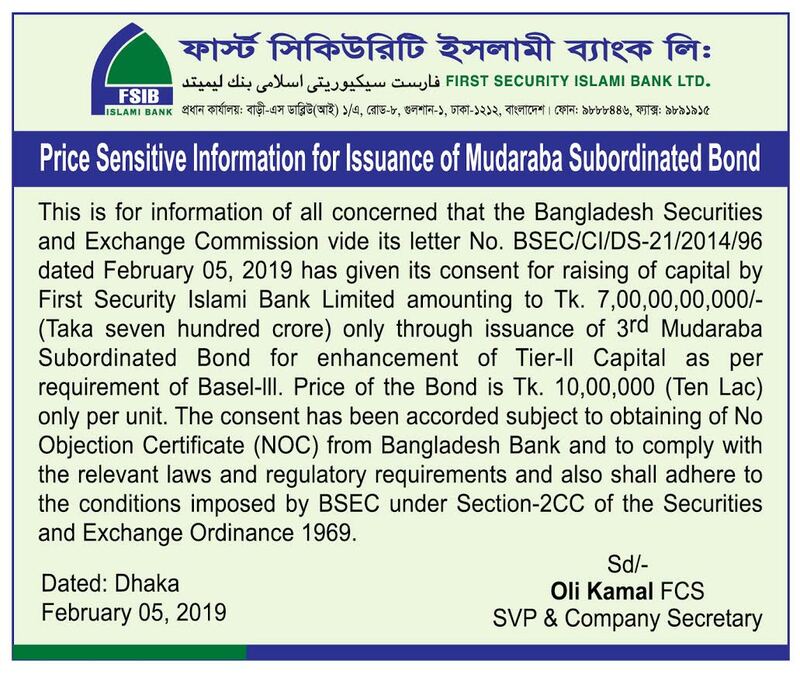 17,65,00,000 (Taka seventeen crore sixty five lac) only (excluding Registration fees, Tax, VAT and other related charges) for opening of a Branch of the Bank subject to approval of Bangladesh Bank.